The origin of “Duo Lautensang” has a history that goes back many years. 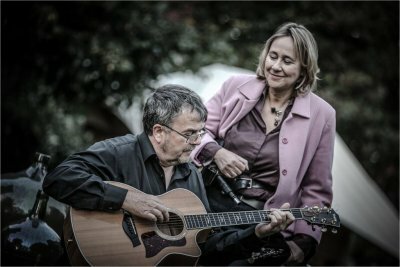 Playing in different groups and searching for the right direction brought both musicians; Astrid Heldmaier and Reiner Köhler together to form what they are today. „Duo Lautensang“ unites the beginning of the late medieval elements, the renaissance into the baroque period with traditional folk music from the 21st century.Musical interpretations have evolved through a combination of historical notation and modern stylistic elements which have unfolded from the traditional folk scene. Thus a variety of new musical options have arisen in this musical journey. Flutes and rare instruments such as „Northumbrian small pipes“ are added with a delicate touch. The small pipes appeared with bellows in the late 17th century. Guitars and the Irish bouzouki give the musical pieces just the right amount of power needed, executing astonishing accents. In addition to the historical songs, the dance tunes enable for a felicitous swing. In case you have any questions concerning the music,“Duo Lautensang” would enjoy hearing from you. In addition, in case venues would like to have the musicians in historical costumes, this can be arranged and booked as well.